Every adult wants to live a version of what he or she imagines is “the good life.” Yet many of us struggle with a default inner voice that tells us that whatever we do will never be good enough and that we will only be happy when we get a new job, relationship, physical appearance, and so on. In How to Survive Your Childhood Now That You’re an Adult: A Path to Authenticity and Awakening, author and psychotherapist Ira Israel explains that the origin of this voice of dissatisfaction is the wounded child within us who is subconsciously and retroactively seeking the acceptance, approval, and love of primary caregivers who either withheld love, loved us conditionally, or treated us in ways we did not understand. 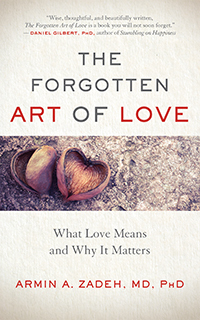 A comprehensive, multifaceted exploration into the nature of love is precisely what Dr. Armin A. Zadeh, who is both a cardiologist and a professor at Johns Hopkins University, offers in his new book, The Forgotten Art of Love: What Love Means and Why It Matters. 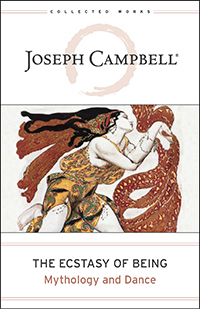 We hope you’ll enjoy this short excerpt. Essentially everything we think and do can be done with love in mind. However, to be aware of this every minute of every day is enormously hard. Unless we were raised to focus on love, it requires extensive training of our brain. That is why Erich Fromm [author of the 1956 classic The Art of Loving] considered love an art — and I agree. What makes us cheat on our diets, run up the debt on our credit cards, and/or date the wrong people? We know these aren’t healthy choices, and that we’re sabotaging our own best interests when we make them, but sometimes we just can’t help it. 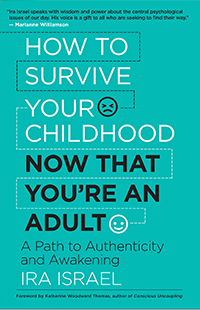 In this inspiring conversation, psychotherapist and author of Taming Your Outer Child Susan Anderson discusses self-sabotaging behaviors and how they often come from an aspect of our personalities that most people aren’t consciously aware of — the Outer Child. She explains the many ways that the Outer Child can wreak havoc on our adult lives and offers a three-pronged program for stopping this self-defeating behavior — behavior that gratifies us in the moment but ultimately prevents us from achieving our most cherished goals and dreams. Find out how you can tame your own Outer Child on this latest episode of New World Now. 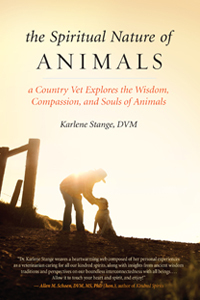 Author Karlene Stange’s spiritual journey began during her work as an ambulatory veterinarian, driving her pickup truck through southwestern Colorado, attending to animals in need of medical care. She has experienced the challenges, sorrows, and joys of working with creatures great and small, and she feels a powerful kinship with these beautiful beings beyond flesh and fur and feathers. Her book, The Spiritual Nature of Animals: A Country Vet Explores the Wisdom, Compassion, and Souls of Animals, chronicles her spiritual path working with animals, through the lenses of various teachings of religious and cultural traditions, as well as her own encounters with the magnificent Rocky Mountain terrain and the quirky characters — both animal and human — who inhabit it.